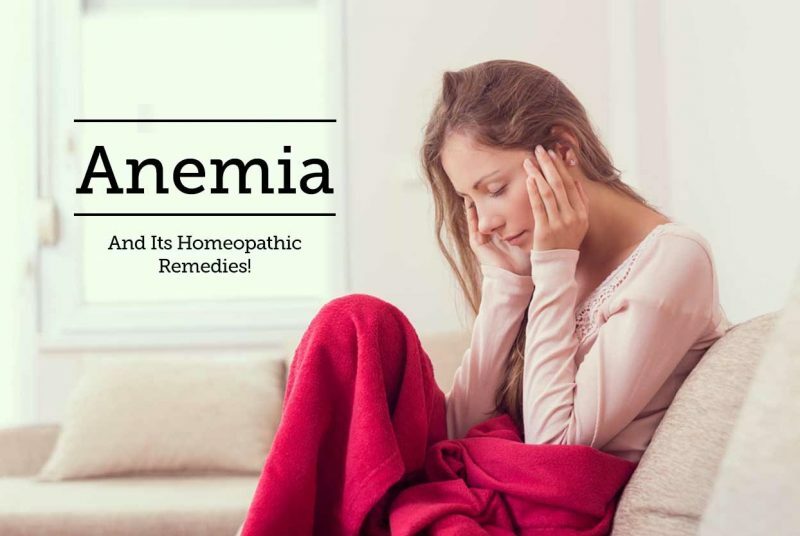 In this post of Homeo Expert, we shall discuss the best homeopathic medicine for Anemia or top homeopathic remedies for Anemia. Anemia is a condition in which the human body does not have sufficient healthy hemoglobin or red blood cells. Therefore, the red blood cells are unable to give adequate oxygen to the tissues of the body. There are different forms of anemia and every form has its own cause. Anemia can be a temporary or long term and in addition, it can also become mild to severe. Your body is not making sufficient red blood cells. Severe bleeding and it results in losing red blood cells quickly in bulk and cannot be replaced. Your body is destroying red blood cells. It is one of the most common types of anemia in the whole world where there is a shortage of iron in the body. Our bone marrow needs sufficient iron to produce hemoglobin and if it is not available it causes Anemia. It can also occur in pregnant woman and it can also occur after the blood loss like heavy menstrual bleeding. Additionally, after iron our body also requires folate and vitamin B-12 to make red blood cells. There are some people who consume enough amount of vitamin B-12 still their bodies do not process the vitamin. It will lead to pernicious anemia. It seldom occurs but also a life-threatening type of anemia and it occurs when our body does not produce enough RBCs. Aplastic Anemia is caused by severe infections, medications and autoimmune diseases. The causes of this anemia are certain diseases including HIV/AIDS, kidney diseases and rheumatoid arthritis. Hemolytic Anemia occurs when the process of destruction of red blood cells is faster than development. You can inherit it like sickle cell anemia. It is also a type of anemia which can also be inherited. The Homeopathic treatment is a natural treatment because the medicines are made of natural substances. In addition, they are also effective in the treatment of Anemia. You need to know that there are no special homeopathic medicines for Anemia because homeopathy mode of treatment follows the symptoms and on an individual basis. There are multiple natural homeopathic remedies for anemia available but I rank homeopathic remedy Ferrum Met at the top of the list. The patient of Ferrum Met seems to be pale and weak and he also feels false flushings after the little excitement. In addition, the patient also comes across pulsating headache, Vertigo and ringing in the ears. The symptoms of shortness of breath, difficulty in breathing along with palpitations are also present in such cases. It is highly recommended for females who become anemic after excessive bleeding during periods. The blood flows in a large quantity and the menstrual cycle lasts more than a normal cycle. If anemia is a result of extreme blood loss, China is the best homeopathic medicine for Anemia. Bleeding can occur due to different causes including excessive bleeding in menses, bleeding from bowels, throat and nose, traumatic injury etc. After the blood loss, the patient experiences faintness and also feels exhausted. Episodes of Vertigo are marked symptoms along with coldness and paleness. Homeopathic medicine China has the ability to control the hemorrhage and also increases the amount of blood after bleeding. Aletris Farinosa is a natural homeopathic remedy for women who suffer from Anemia along with fatigue and weakness. The patient feels tiredness and weariness in such cases. The patient feels that her body is powerless and the energy levels are also reduced. Paleness of face and vertigo are also present. If Anemia occurs due to repeated abortions, homeopathic medicine Aletris Farinos is the top homeopathic medicine for Anemia in such cases. It can also be used if the Anemia occurs due to a large amount of bleeding during periods. If weight loss is a result of Anemia, Natrum Mur is a natural remedy to control weight loss in such cases. The patient of this medicine seems to be very lean and emaciated with a loss of flesh. If headache is a result of Anemia, Natrum Mur acts very efficiently to control it. Headache may accompany vomiting and nausea. Natrum Mur is another homeopathic medicine for Anemia when the patient feels palpitations. This homeopathic medicine can control palpitations if it occurs due to decreased blood. Natrum Mur is the homeopathic treatment for Anemia when it occurs due to longlasting grief. The patient of this medicine desires for extra salt in Anemia. Ferrum Phos is a natural homeopathic medicine which can be used to maintain or increase hemoglobin levels. It is best and safe for all age groups and it is helpful when Anemia occurs in pregnancy. Note: This homeopathic remedy should be used after consulting a competent homeopathic doctor and dosage should be prescribed by competent physician/homeo doctor. The patient of Ferrum Phos also feels palpitation and weakness along with paleness of skin. Headache and Vertigo are also present as symptoms. If the patient is sweating in Anemia especially at night, Ferrum Phos can control the symptoms. China and Ferrum Met are the best homeopathic treatment for Anemia and they have the ability to refill the blood loss. When the patient feels weakness, coldness and palpitations, Ferrum Met is used. China is considered when the patient feels faintness and vertigo with complete physical and mental weakness due to bleeding. Phosphorus and Picric Acid are the best natural homeopathic remedies for Pernicious Anemia. In Picric Acid, the symptoms of weakness and prostration are present. The patient also feels tiredness along with weakness throughout the day. In addition, the patient also feels tingling in limbs along with needle-like sensation and he does not want to do any kind of work. Phosphorus is another homeopathic remedy for this condition where there is a numbness of hand and arms occur. Longlasting diarrhea with weakness is also seen. The patient also wants to have ice creams and cold drinks and it indicates the usage of Phosphorus. Natrum Mur and Arsenicum Album are the top natural homeopathic medicines for anemia due to Malaria. Natrum Mur is a useful remedy for anemia when the patient becomes thin due to weakness. The history of chronic Malaria is also present in such cases. It is also used as an antidote to all the anti-malarial drugs. The patient of this medicine feels weakness in the morning. It may occur with palpitations and migraine. Excessive desire for salt is an indicating symptom of this medicine. Arsenicum Album is a remarkable medicine when the patient feels weakness and it becomes worse at night. Even a slight physical or mental effort leads to a worse condition. The symptoms of anxiety and restlessness are also marked. Nux Vomica, Calcarea Phos and Alumina are excellent natural homeopathic remedies for Anemia when the reason is nutritional disturbances. Alumina is another homeopathic medicine for Anemia when there is a sluggishness of the gastric system present along with constipation. The intestines of the patient remain sluggish for many days and the patient does not have any desire for passing the stool. Pica (desire for chalk, ground or indigestible things) with constipation is a dominant symptom of this medicine and the patient is also sensitive to cold air. The symptom of sensitivity to cold air is also present in Homeopathic medicine Nux Vomica along with constipation. But the symptom of constipation is opposite to Alumina. In Nux Vomica, the patient passes stool which is scanty in nature. The patient also feels heaviness and acidity in the abdomen. Calcarea Phos is a suitable homeopathic medicine for Anemia in children when they also have weak digestive power or system. The abdomen remains full of gas and desire for meat and salt is also present. The bones of the child are also weak and he is irritable in nature. If you are looking for homeopathic medicine for Anemia during pregnancy, Ferrum Phos and Aletris Farinosa are the best natural homeopathic remedies for such cases. Ferrum Phos proves to be a valuable medicine in all cases of Anemia during pregnancy. It includes symptoms like weakness, paleness and palpitations along with fast pulse. Aletris Farinosa is the best homeopathic remedy for Anemia when the symptoms of tiredness and weariness are marked. Vertigo and Fainting may accompany. Homeopathic medicines are safe if you use them after consulting a qualified or competent doctor. So you better consult a qualified doctor and do not self medicate. Calcarea Carb and Alumina are the top natural homeopathic treatment for Anemia when Pica is present. Alumina is prescribed when the patient desires for coffee or chalk, tea grounds or dry rice etc. Pica is also another symptom with constipation in this medicine. I recommend homeopathic medicine Calcarea Carb when the patient craves for chalk, lime and pencils. In addition, the patient also wants to have boiled eggs with an increased sweat on his head and it indicates the usage of Calcarea Carb. If the patient feels palpitations along with Anemia, Natrum Mur and Ferrum Met are the natural homeopathic medicines which come to mind. Ferrum Met is an excellent medicine when the symptom of palpitation becomes worse with motion. Difficulty in breathing and chest oppression may also accompany. In Natrum Mur, the palpitations are violent in nature and have the ability to shake the whole body. Ferrum Met, China and Natrum Mur are the top homeopathic treatment for anemia with weakness. The patient of Ferrum Met feels weakness during speaking and walking. China is the best homeopathic medicine for Anemia when weakness and vertigo are also present and it gets worse in the morning.